Hamburgers and ice cream close by. What else could you want? Not many neighborhoods can brag about such a convenience. Allandale’s fortune came partly out of luck. 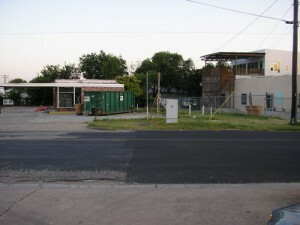 Locating Amy’s Ice Cream and Phil’s Ice House in Allandale along Burnet Road was not part of a grand plan, it was simple economics. Husband and wife Steve and Amy Simmons (see family photo above) had outgrown the 1,800 SF building on Guadalupe and finding enough space at the right price took them north. 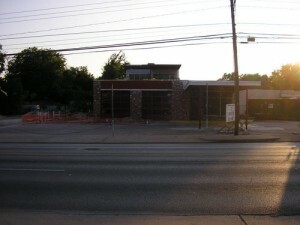 Steve found the vacant building that now serves as their offices and production facility and made an offer. At the time that was all they were interested in. They were not considering another location for an Amy’s Ice Cream or for their first Phil’s Ice House. That changed when the owner let them know the adjacent building that fronted Burnet Road, a used car lot, was also available. They were familiar with the neighborhood. Amy once considered buying a house in Allandale. The attraction was there. It didn’t take them long to decide the location made sense. And in the short time they’ve been opened they’ve been very pleased with that decision. Both Amy’s and Phil’s Ice House have exceeded their expectations. The office and production facility went in first. 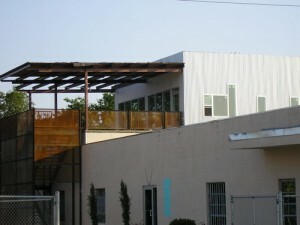 They went from a 1,800 sf space on Guadalupe to the 6,000 sf building there in now. The building was formerly a Post Office (1945-1970). Amy’s opened in September, 2005 (for a photo chronicle of the construction, see Neighborhood Watch), followed by Phil’s Ice House in March, 2006. 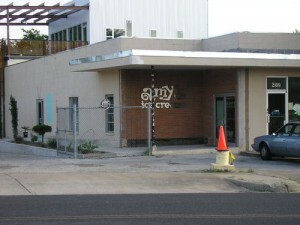 Amy’s has 10 locations in Austin, 2 in Houston and one in San Antonio. They’re taking a breather from adding more locations at this time. However, Steve said if he could find another gas station he’d consider opening another Phil’s Ice House. It was clear from my visit with Steve and Amy they are very pleased with their new location. And judging from the number of people at Amy’s and Phil’s throughout the day, they are a welcomed addition to the neighborhood. For more information about Amy’s, it’s history, locations, and more check out their website.